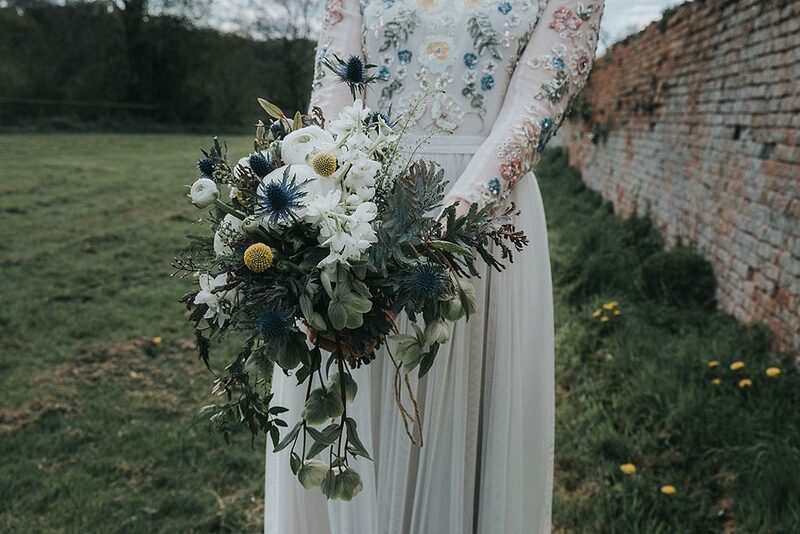 We cannot get enough of these breathtakingly beautiful photos of Becky and Kip's wedding that bring back wonderful Spring memories by the incredibly talented, Christine McNally. Christine is a Warwickshire based wedding photographer (who can travel all over the UK) and loves making beautiful photographs and capturing the little things on a wedding day that will matter so much. If you are searching for a wedding photographer who is lots of fun to work with and creates romantic and timeless photographs, then this lady is the one for you! Becky and Kip booked me after seeing a recommendation in the Rock n Roll bride Facebook group. 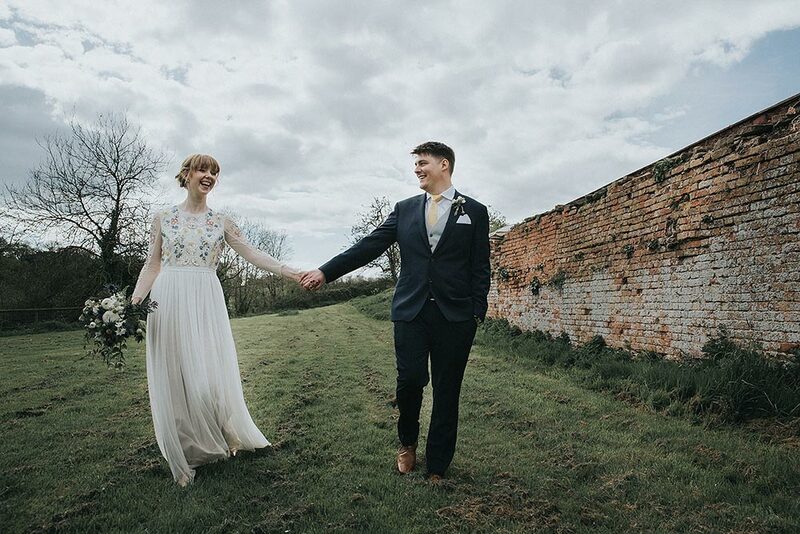 I was super excited that they’d decided to have me as their wedding photographer, especially considering their wedding was in Somerset, and I am a wedding photographer in Warwickshire. Becky was awesome to communicate with beforehand, and I knew their wedding was going to be spectacular. What their wedding had in store for me however exceeded all my expectations, and really set my 2016 off with a storm. I booked myself in to the Travellodge in Wellington so that I would be ’round the corner on the morning, to avoid any traffic issues on the day. I made my way to Becky’s parents house which was absolutely gorgeous. Amazing light, and a perfect space for Becky to get ready. She had a lovely hairdresser style her hair into a simple elegant look, nothing too formal or tight. She did her own makeup which was done brilliantly, and she was one of the most relaxed brides I have met. Her family were incredibly welcoming and I really enjoyed photographing bridal preparations. 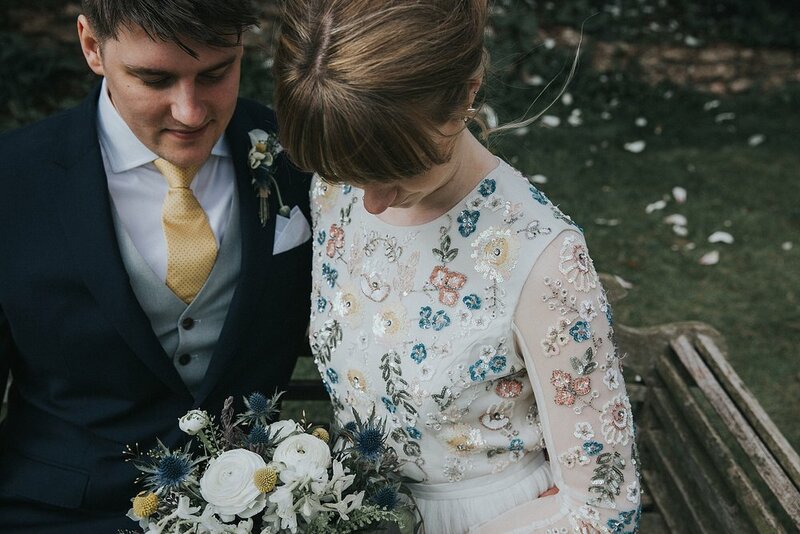 Becky wore a stunning embroided wedding dress from Needle and Thread. I headed to the church where I met the loveliest of vicar’s. She was welcoming, and gave me free reign to take the photos I needed. Sometimes photographing relgious ceremonies can be quite restrictive and photographers aren’t allowed much movement (or in some cases, allowed to take photographs at all). She was funny, helpful and made my time photographing at the church a lovely experience. 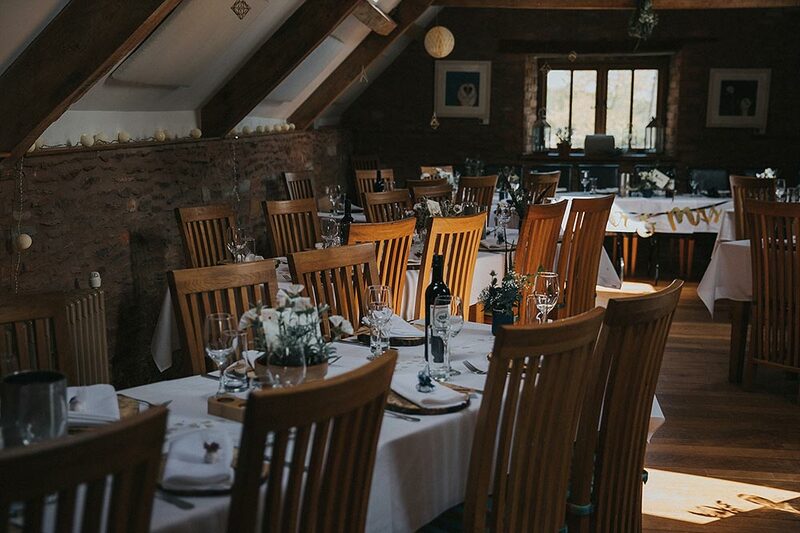 After all the guests got on the bus, we headed over to Clavelshay Barn where we had the wedding reception. The weather was amazing, with guests wearing sunglasses and enjoying drinks and canapes outside. Becky, Kip, their family and the staff at the Clavelshay barn went over and beyond in decorating the tables/reception room. 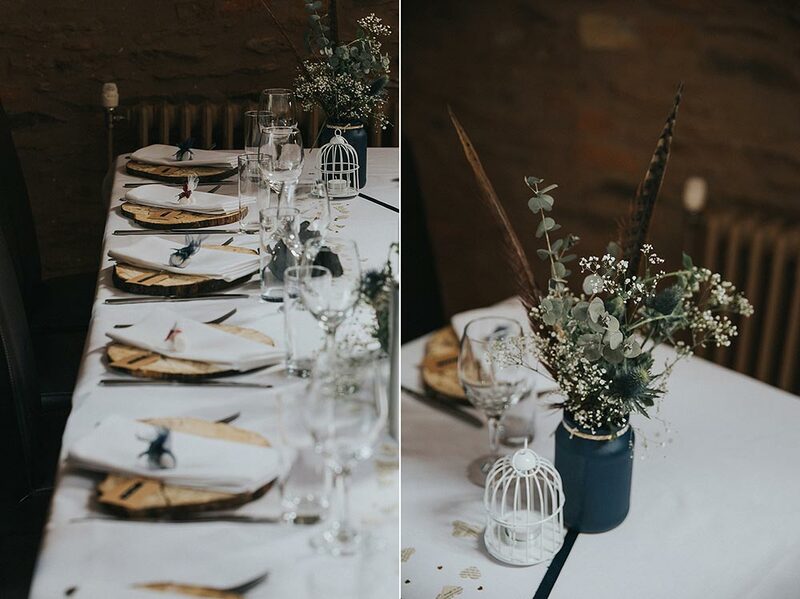 There were beautiful flowers, thistle and feathers everywhere, with arty bits and bobs hanging from the ceiling of the barn. 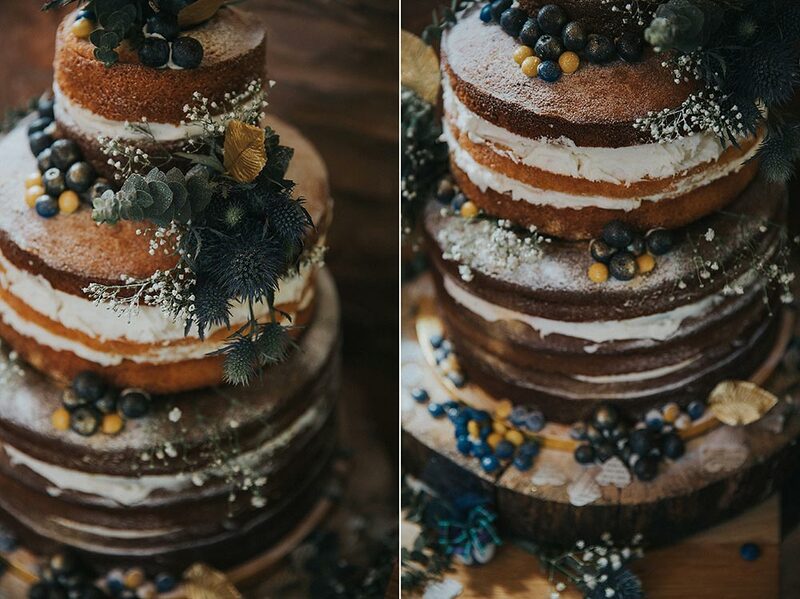 Their cake was made by the groom, Kip’s mum and sister and transported from Oxford to Somerset. It’s one of the most incredible wedding cakes I have seen. With chocolate sponge tiers, gorgeous filling, M&M’s (because Kip loves them!) that matched their colour scheme, and a topping of Thistle to match the flowers. 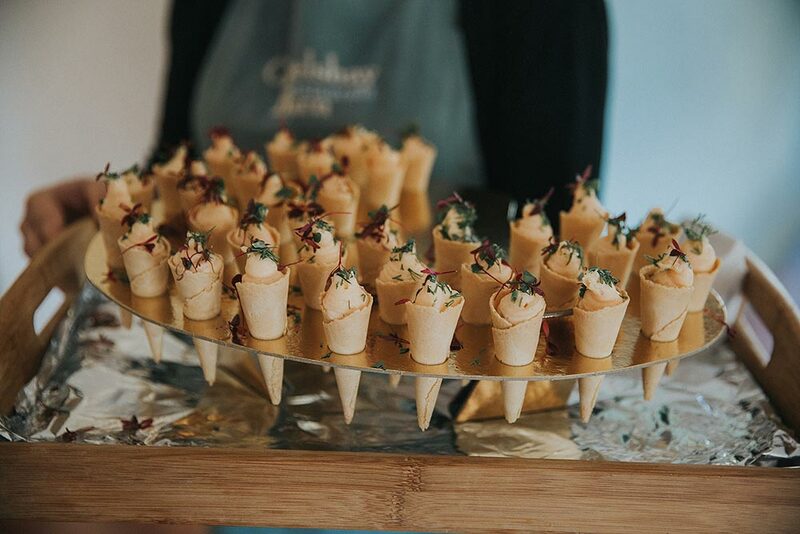 The food at the Clavelshay Barn has to be on of my top 3 favourite meals I have had at a wedding.. and I’ve had alot of wedding food! Their portions are exceptional, the food so tender and well flavoured and I’ve run out of adjectives to explain how wonderful this venue is. The staff were always smiling and helpful and it was so lovely to have the venue as exclusive use for the day.